The word "Versailles" packs a good dose of mystique: even if you don't know much about the legendary French chateau, its name alone tends to conjure up images of royal pomp, power and opulence in most people's minds. This is all for very good reason: the Palace and gardens, mostly developed under King Louis XIV in the late 17th century, are among the world's most extravagant, and represent a feat in French architecture and landscaping. No wonder it's been named a UNESCO World Heritage site. As the home of the last King and Queen of France, Versailles also symbolizes the height of French royal decadence, and the country's tumultuous, centuries-long transition from monarchy to Republic. Situated less than an hour from central Paris by train or car, the Chateau and gardens attract some 6 million visitors every year-- coming in just behind the Eiffel Tower as one of France's most popular attractions. It's especially idyllic during the warmer months ​when the lush, expansive gardens, fountains and statuary mean you can spend a good deal of time outside for walks, picnics and elaborate "Musical Water" shows. Whether you're a first-time visitor looking for practical information on your upcoming trip to the Palace, or want to dig a bit deeper into Versailles' fascinating history and see highlights from the Chateau, scroll down for much more. Especially on a first trip to the Palace and Gardens, visitors often feel overwhelmed by the enormity of the grounds: what to see and do in priority, and what can be left to a second visit down the line? First, once you've purchased your ticket and procured a free audio guide at the main entrance, explore the main Palace. Allow two to three hours to fully explore the palace, or focus on a few of the more famous chambers in an hour or two. Consisting of a dizzying 2,300 rooms, the sprawling chateau includes highlights such as the stunning Hall of Mirrors, the King's Apartments and Royal Bedchamber, The Royal Operahouse, Marie-Antoinette's Bedrooms, and the Battles Gallery. Particularly if you're visiting in the spring, summer or early fall, a long stroll through the elaborate formal gardens designed by famed landscape architect André Le Nôtre are in order. Numerous elaborate fountains and sculptures cover the grounds around Versailles and are worth admiring in detail. Consider booking a ticket for an evening show featuring music and illuminations around the fountains/sculpture garden. If you've got a full day to consecrate to exploring the vast estate at Versailles, consider seeing the Grand and Petit Trianon and get away from the hordes of tourists. These more intimate quarters were built by French monarchs to escape the commotion and political intrigues of Palace life — and to bring their lovers, of course. The refined architecture is renowned, too — and there's even a quiet, English-style garden on the ground of the Trianon Estate. Last but not least, this charming nook on the Estate was Marie-Antoinette's preferred place (apart from Le Petit Trianon) to get away, and (scandalously) play at simple peasant life. It's charming, bucolic and vaguely Disney-esque — but worth an hour or so. The easiest way to get to Versailles from central Paris is to take the RER (commuter train) Line C to the Chateau de Versailles-Rive Gauche station, then follow the signs to the Palace entrance (10 minutes by foot). For visitors with limited mobility, taking a bus or coach might be a better option. The Versailles Express is a shuttle service running from the Eiffel Tower to the palace, and runs from Tuesday to Sunday. Alternatively, the city bus line 171 runs daily from nearby the Pont de Sèvres metro station (line 9) and drops visitors close to the Palace entrance. The trip takes only around 30 minutes. The Palace and gardens are open year-round, but do be aware that there are high-season and low-season hours. Below are the high-season opening times; see this page for information on the low season (November 1st through March 31st). Between April 1st and October 31st, the main Palace is open Tuesday to Sunday, 9:00 a.m. to 6:30 p.m. (closed on Mondays and on May 1st). Last tickets are sold at 5:50 p.m. and last admission ​is at 6:00 p.m. The Estate of Trianon is open during the same days, from 12:00 p.m. to 6:30 p.m. Last admission is at 6:00 p.m. The gardens are open every day from 8:00 a.m. to 8:30 p.m., including on Mondays. A separate ticket for the gardens alone may be purchased. For entrance to the main Palace, head to the Main Courtyard. If you already have a printed or e-ticket or are eligible for free admission, head directly to entrance A; otherwise, proceed to the ticket office, located on the left-hand side of the courtyard. A special access path for visitors with limited mobility is located near the main gate. Guide dogs are permitted on the premises with proof of identification. For access to the Grand or Petit Trianon, follow the signs from the main entrance; there is a separate ticket office for visitors who only wish to visit the Trianon Estate or begin their visit there. For a current list of ticket prices and how to obtain them, see this page at the official website. Purchasing tickets online is highly recommended to avoid waiting in long lines. Concessions/reduced-price tickets are granted for students, people with reduced mobility and their guides. Entrance is free for all visitors under the age of 18 and for European Union citizens under the age of 26 . Guided tours of the Palace grounds and gardens are offered on select days for individuals and groups. See this page for a complete list of tours and current prices, as well as information about how to reserve. Audio guides are free for all visitors and can be obtained at the main entry point to the palace, as well as in the Lower Gallery near the Ladies' Apartments. Temporary exhibits and musical shows at Versailles give visitors with an interest in digging a bit deeper a more focused look at the history, artistic works, and people of note surrounding the Palace. The "Musical Waters" show is immensely popular in the summer. Visitor facilities at Versailles include free wi-fi, gift shops, numerous cafes and restaurants, left luggage and baby changing stations, and information desks. No visit to Versailles would be complete without a visit to the awe-inspiring, if admittedly rather gaudy, Hall of Mirrors. Designed to embody the power, pomp and elegance of the French monarchy and its considerable military prowess, the 73-meter gallery — which was recently refurbished to its former glory — features 373 mirrors situated around 17 arches. At the times of the gallery's construction, mirrors of this caliber were luxurious items available to only a select few. Le Brun's vaulted ceiling is decorated with 30 paintings illustrating the military prowess and success of France. The long gallery was long used to receive dignitaries and officials, and to hold formal events such as balls and royal weddings. It was also the room where the Treaty of Versailles was signed in 1919, marking the formal end of World War I. Make sure to see the adjoining, and impressive, rooms such as the War Room and the Peace Room. 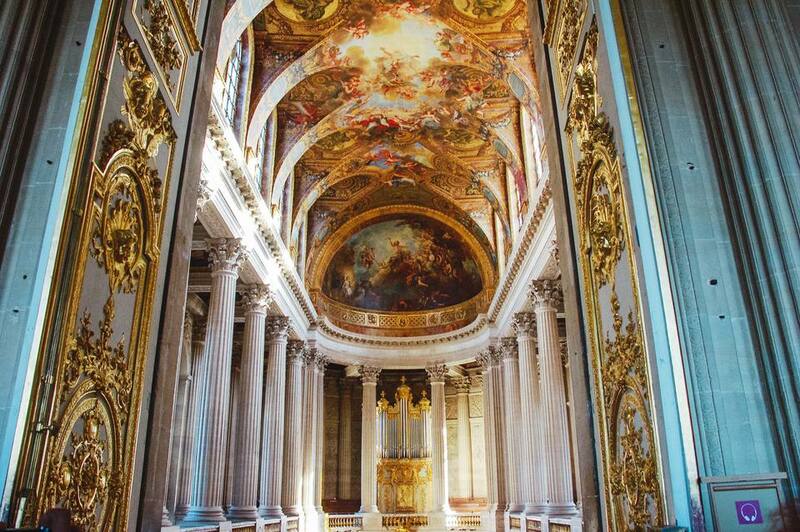 Another highlight within the walls of the main Palace at Versailles are the King's Apartments and Royal Bedrooms. More intimate than the King's State Apartments, which were used primarily for official functions and are accordingly lavish, these apartments offer a bit more of a glimpse into the daily life of King Louis XIV. The room known as the Bull's Eye Antechamber leads directly onto the Hall of Mirrors and the Queen's Apartments; while the Royal Table Antechamber was the Sun King's preferred spot for public dining. The King's Bedchamber, meanwhile, is an enormous room that connects in three places to the Hall of Mirrors. King Louis XIV performed elaborate "waking up" and "retiring to bed" ceremonies here, and died in the room in 1715, following a reign that lasted 72 years. After visiting the main Palace, head outside into the extensive and gorgeous gardens. Planned and designed by Le Notre, the gardens represent the height of Renaissance-era harmony and symmetry, with their elaborately formed shrubs, parterres and trees. Dozens of varieties of flowers and trees abound on the Estate, with enormous fountains and sculptures adding to the ambiance of calm regality that pervades throughout. The gardens are vast, so focusing your visit is a good idea if you don't have a whole morning or afternoon to leisurely explore them. The "Grande Perspective" (Great Perspective) over the gardens can be viewed from inside the palace and the Hall of Mirrors: gazing out over the central "Water Parterre" allows for a breathtaking east-west perspective over the vast gardens — the graceful, symmetrical play between greenery, large water pools, fountains and statuary. The path from the foot of the "Grande Perspective" goes past Leto's ornate fountain and parterre, through to the water canal. Around the base of the palace there are two other main paths or "parterres", both of which can be viewed from the Water Parterre: the North and South Parterres. The Northern section is " introduced" by two prominent bronze statues from 1688, " The Grinder" and "Modest Venus". A large circular pool divides the area. Moving northward, take in the gorgeous Pyramid Fountain, designed by Charles Le Brun, and featuring elaborate statues depicting dolphins, crayfish and Tritons. Meanwhile, The South Parterre (also referred to as the Flower Garden) is "guarded" by two bronze sphinxes added in 1685 (they were previously in another location on the Estate). From the balustrade, you can take in gorgeous perspectives over the lush Orangery. Leto's Parterre is arguably one of the most beautiful spots on the Versailles estate. This vast, minimalist garden, commissioned by Louis XIV and built in the 1660s, shows off Le Notre's gift for harmonious forms in landscaping, with its simple yet visually arresting "curl" and "fan" shapes. The breathtaking central fountain with its allegorical sculptures was inspired by Ovid's mythical tales in The Metamorphoses. Commissioned by the Sun King (Louis XIV) as an alternative residence on the Estate — one that would grant him some reprieve from the stresses and politics of courtly life — the Trianon Estate is one of the most sumptuous, intimate and elegant places at Versailles. Many tourists entirely neglect it, making it a quieter, less crowded place to explore on the Estate. The Grand Trianon, an Italian-inspired palace featuring pink marble, ornate archways and lush gardens that feel far more intimate than those flanking the main palace, was a place where the King retired to pursue his affair with his mistress, Mme de Montespan. The Petit Trianon, meanwhile, was the preferred place for Queen Marie-Antoinette to retire to, alongside her bucolic "hamlet". The Queen's Hamlet: Marie-Antoinette's "Peasant Village"
One of the quirkiest places on the Estate is this cozy sanctuary designed for Marie-Antoinette, yet again as a place to retreat from the stresses of courtly life. Beginning in 1777, the Queen ordered a redesign of the Trianon estate; she first has English Gardens built to contrast with the stark rationalism and pomp of the existing gardens at Versailles. She then commissioned a "hamlet" consisting in a faux-village — representing, perhaps, the comforting ordinariness of commoner life — and an artificial lake. For some, the Hamlet represents the ill-fated Queen's tendency to sentimentalize peasant life without acknowledging the suffering of her subjects; for others, it exemplifies her shy nature and dislike of courtly life, with all its rigors and demands. Today, various farm animals are kept at a sanctuary on the hamlet, making it a pleasant place for a stroll with young visitors in particular. 1623-1624: The young prince who would later be named King Louis XIII establishes Versailles as a hunting lodge, enamored with its beauty and abundant game. He began construction of a Palace on the grounds from 1631, and it was completed in 1634. 1661: The young King Louis XIV, wishing to consolidate royal power at Versailles and displace it from its traditional seat in Paris, undertakes ambitious construction that would last until the end of his life. The palace and gardens that we see today are largely the results of his vision and persistence; he notably hired the brilliant landscape architect André Le Nôtre to conceive the Palace's lavish gardens, fountains and statuary. An enthusiastic patron of arts, culture and music, Versailles flourished under the Sun King not only as the seat of French royal power, but also as a place for brilliant artists such as the playwright Molière to come present their work at court. 1715: After the death of Louis XIV, Versailles is temporarily abandoned as his son, Louis XV, takes the throne back in Paris. The King would return to Versailles in 1722, and under his reign, the estate was developed further; the Royal Opera House was notably completed during this period. An assassination attempt was made by Damien on the King in 1757; this period is also noteworthy owing to a child prodigy named Wolfgang Amadeus Mozart performing here. 1770: The future King Louis XVI, who was born at Versailles, weds the Austrian Archduchess Marie-Antoinette at the Royal Opera House on the Estate. They are 15 and 14 years old, respectively, at the time of their marriage. The Prince celebrates his coronation as Louis XVI in 1775. 1789: In the heat of the French Revolution, Louis XVI, Marie-Antoinette and their young children are forced to leave Versailles for Paris, where they are dethroned (1791) and later executed by guillotine on the Place de la Concorde in 1793. 19th century: No longer the seat of royal or imperial power — Napoleon I chose not to reign from Versailles — the Estate enters a period of flux, eventually becoming a royal Museum under the Restoration Monarchy. 1919: The infamous Treaty of Versailles, ending World War I but arguably planting the seeds for the next "Great War" in Europe, is signed here.